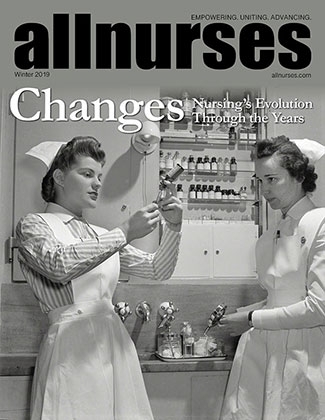 Should mental health nursing be grouped with addictions nursing? I often wondered if there was an addict that did not have an underlying mental illness diagnosis. I suspect that all addicts have substance abuse/addiction as a secondary issue. I believe the majority of addicts have dual diagnosis. One hospital rehab that I worked at, would get transfers from the psych ward, once they were stabilized there. I agree with Saiderap. It is not a one size fits all. You will have SA that are quiet, withdrawn, depressed, and you can have other patients that are abusive. There will always be some type of mix, including MR patients. Some are disruptive and can be physically abusive. And, you will have axis II patients. In an acute hospitalization, it is difficult to separate them. Did I shoot myself in the foot by disclosing? I am sorry that you have to disclose that information. It truly does not seem fair, if they do not ask for other disclosures for other illnesses!! That is quite intrusive, especially if you have been stable. I was looking at life insurance application for my adult children. One of the questions was being treated for mental illness, in the last five years. I wondered if that would increase the premium? There are many that should be treated and are not. Shouldn't be penalized for getting treatment. Sorry, I strayed from the topic here. You did the right thing! Best wishes to you! I think that you should check with BON to check the scope of LPN in your state. IMHO, I think that nursing homes are grossly understaffed with the nurse/patient ratio. I just don't see how residents can get quality care, when nurses have so many to care for. The med pass without any extra complications thrown in. (falls, medical emergencies, admissions, etc.) Even with aides, they seem understaffed. I have so much respect for an LPN that can handle the large patient load in nursing homes! I worked in a psychiatric hospital, and the most geriatric patients I ever cared for was 15. And, we had two techs on the unit. So, how was your interview? If you recently took boards and passed, then you have reviewed theory. Your skills will come back to you. Congratulations on passing the board after a 6 year hiatus! Does suctioning trach's ever get easier? I have only had one trach patient. It did not bother me. I have had two tracheostomies myself before becoming a nurse. I have empathy for the patient with a tracheostomy. I was able to tolerate feces. I have a hard time with vomit, especially with undigested food. That is really rough for me! I can recall a night when most of our unit geri patients had a case of "code brown". I don't know what it was, but we cleaned one up, then another patient had an explosion. And, the last patient we had cleaned up at the end of our shift took three tries. We thought we were all done - washed him up, changed his bedding, gown, put him back in bed, then he had another mess. Then cleaned him up, putting another brief on him, and he had another mess. This last time, right after we cleaned him up, he went again. All we did that night was clean up poop, change bedding the whole shift. Funny thing is that we had a good time that night. It sure stunk, but we could not help but laugh. It was just unbelievable! I am a very per diem nurse for DD patients in group home setting. I just give insulin to one patient. When I first started, two additonal patients.However, I am down to one, as the other residents no longer need injections. I work an average of 20 hours a month. They are just one hour visits and not shifts. I feel some of the questions on this self evaluation do not even apply to me. However, it says that all questions must be answered. One question that really has me stumped is how changes since my last evaluation have affected my job performance. And, what do I need to address these changes beside additional training. This is a tough one, as I have only one patient and work minimally. I would like to put not applicable. However, I am wondering if that would really be frowned upon, since it says they all must be answered. I think they are looking for ways to improve. I don't think anything negative should be stated. The only thing that I can think of is that my client changed residence, and I needed to make sure that house staff was aware of his diet guidelines. But, that has not affected my job performance. So, would it be okay to say that this situation does not apply to me, as I only have one client. I am a caregiver for my mother, so this job was what fit my needs at the time. However, things have changed, and I have help with my mother. I am looking for additional work, as at this compnay there are no other positons for LPN opening anytime soon. But, I would like to continue with this job, too. I don't want to shoot myself in the foot. Or, maybe I am overthinking this too much? All med errors should be reported. Some nurses are more worried about their jobs than the patient. I am a human first and care for the patient. I would risk my job before I'd risk a person's life. One time I made a serious error and gave a patient 45 units of Novolog instead of Lantus. I could not believe it when people said that at least I was honest about it. I could not understand how anyone would not be in that situation. I could not go home knowing that my patient was about to be in serious danger if said nothing. We are human and make mistakes. Not owning up to them is worse than the actual med error. And, I think that anyone blaming another colleague for filling out incident report to improve care, should be disciplined. I have had drs. make mistakes with my care and were honest about it. I respect them for being honest with me. Incident reports are made to examine what you can do to make improvements. It leads towards quality care. Once an incident report is filed, then you meet with clinical supervisor to see what can be done to prevent this in the future. It is not meant to be a punitive action. Yes my son contacted the ombudsman. I told him that he has no proof, so he can not say that he suspects that she stole the money. He did report how she made herself POA. That is a fact. I told my son that he can report only fact, and leave out the emotion. So, I guess they are going to investigate it. I am letting my son take care of it, as I am no longer related to her. I just hope this poor woman gets the proper care. Thanks for reply. I just did not know where to start. I would hate to see my ex SIL try to take her out of nursing home, and abuse/neglect her. My ex-MIL is in nursing home. She had a stroke in Jan. She had a biopsy and was off her Coumadin and not bridged. By the time, she was discovered it was too late to give her anything. A little background here. Her daughter lives four hours away. My ex- was staying in her late sister's house. However, as soon as she had a stroke, her nephew jumped on chance to move her out and sell the house. Her daughter came up to stay at the house for 12 weeks. Then her plan was to move her to the state where she lives. Her insurance would not pay for another state, so she needed to wait for new enrollment period to change. (I think she may have been looking at her SS check) Her daughter appointed herself POA. (illegally) She was a notary in another state, and made herself POA. Once upon a time, she was actually her POA. Ex-MIL removed her as her POA, as she basically lost her house. Her daughter took a second mortgage out against the house(behind her mom's back) She quit making payments, the house went into foreclosure. My ex-MIL was essentially homeless. She moved in with her sister. The sister just died last fall. My exMIL remained in home until she had stroke. My ex-Sister-in-law moved back home. My daughter and I went to visit my ex- mother-in-law, yesterday. I assumed that her daughter checked on her frequently. The social worker at the home told us that they left numerous messages with my ex SIL, and she never calls. They are not allowed to give us any information. I am on the list for medical information, only. I am concerned what is going on with her. How do I get any type of info? eg Would they move her to another home, if the bill is not being paid? My ex SIL allegedly took 4000 from her mom's purse when she went to hospital. Also, sold her car for $5000. I know there is something shady going on. My only concern is that my exMIL receive adequate care and have an advocate for her. My ex husband had a stroke a few years ago, and is not mentally competent. Currently, I am caring for my own mother with dementia, so I am not in a position to help her. I know this is not a nursing issue, but I was wondering if anyone that works in SNF can steer me in direction to find an advocate for my exMIL? any nurses/nursing students on methadone? Unfortunately, my daughter is returning to methadone clinic. She tried to do without it. She was extremely fatigued and had boy aches. I don't know, if it was long term withdrawal or effects of Seroquel that she is taking. She lost her job. And, has started taking opiates again to get energy to things done. I did not want her to return to methadone. I did agree with Adderall, as she does have documented ADD. Unfortunately, the dr. started her at a low dose, so she still went out to get opiates. I feel like she is going backwards. She is returning to clinic without my blessing. But, that is her decision. I just told her that I am not going out of my way to give her rides early in the morning. She should have had take home privileges at the clinic before.. she had them a few times. She always made excuses why she lost take homes. I knew the truth was that she was positive for THC. I was so proud of her for her deciding not to go back to clinic after she was out of jail. But, if that is what she has to do, then so be it. I just feel bad because whenever she goes to ER or somewhere and has to state her meds, they really treat her with such rudeness. People can be quite judgmental. She would like to take CNA classes, but Idk, if she should check into state BON for that. I wonder if she would be allowed to work as CNA while being on methadone. PA in itself is not a methadone friendly state. Beautiful article!!! We had hospice for my brother. I would love to be a hospice nurse. However, I really don't have any med/surg experience. I did not become a nurse until I was 40. I worked in behavioral health. I worked in drug rehab an psychiatric hospital. Currently, I work prn for group home. I am a caregiver for my mother. She is 88 and has some dementia. I believe that it is radiation induced. (chemo and radiation to brain in 2012) My mother was diagnosed with lymphoma in Sept. 2011. She chose to have the chemo and radiation. I would have chosen palliative care, but she had a fear of dying. I believe that she is over her fear now. She has verbalized that she is ready to go now especially since my brother died. I would like to get into hospice nursing, when my mother no longer needs me. Although, I think that my chances of getting a hospice position are slim. I know that some people have told me that would be such a depressing job. I disagree. Death is a part of life. My brother went quick, but it was so violent. I was glad when his suffering was over. He chose to die after we took a short break from hospital. I was so upset that we weren't there, but nurse told me that happens a lot. They wait for people to leave. My desire to be a hospice nurse was before my brother was a hospice patient. Again, beautiful article! jadelpn, I agree 100%! I thought of that when I was going over it in my head. I have always been so careful with my checks. Today, I was careless! That is going to be in my plan of action for correction. There is no other nurse to verify, but there is a residential worker that can verify that I am giving insulin that is stated on the MAR! I worked at a facility where insulin needed to be verified by another nurse. The other workers were trying to comfort me in telling me that mistakes happen. Yes, but this was way too dangerous!!! It is going to take me a long time to get over this error! I just thank God that I realized what I had done before it was too late. I never heard of "fit for duty". What a croc!!!! Why is that not a HIPPA? If the dr. states that it does not impair you than that should be sufficient. I am not an addict, but I have a daughter in recovery. She was in methadone treatment for years. She kept trying to wean. The withdrawal lasts really long from methadone. I think that suboxone is slightly shorter withdrawal. She weaned over to suboxone a few years ago. Then, she relapsed and told me that suboxone did not work for her. She told me that she needed the structure of daily dosing at clinic. She got a DUI, after pulling out of parking lot of clinic. Cop was watching her and followed her. She was guilty of speeding. Anyways, she admitted to dosing at the clinic. Took her to hospital for lab draws. She was only positive for methadone, but was still charged with DUI. My daughter was involuntarily detoxed while being in jail just two months ago. She was cited for driving while license was suspended. She was given a sentence of 60 days house arrest with work release. Unfortunately, she could not refrain from the pot. When she went to report for house arrest, she was positive for THC. She did not stop to think they may drug test her. Silly girl! The blessing in disguise was that she was sentenced to do her time in jail until she tested clean. It took 30 days. During that time she went through awful withdrawal. I am proud of her for making decision to not to return to the clinic, once released from jail. She served the rest of time on house arrest. She said that she never wants to go through the hell of methadone withdrawal again. That is why people remain on it for so long. They can not live a functional, productive life without it. People need to work, and can't go through withdrawal and function. Methadone withdrawal lasts a long time. The long half life makes it hell to get off the drug. I always wondered why people were on it for years, too. I just found out that my son is an IV heroin addict. My daughter is in recovery, and my son is a heroin addict. My ex was an opiate addict. Actually, a heroin IV addict, too. He had liver cancer. He had a liver transplant and is doing okay for the liver. It breaks my heart that my son is following his dad's footsteps. Drug addiction is bad enough, but IV use is just adding a whole new list of complications. Kudos to all of you in recovery!!! And, FWIW, I don't think methadone impairs a person. It helps people live a functional life. OTOH, it is hard on the body, as any drug is. And, it is hell to get off of it. I just commited a med error similar to one above. I mean similar in regards to the insulin. I am an LPN and work per diem for patient on insulin. I was horrified to discover that I gave pt. 45 units of Novolg. It should have been Lantus. I discovered as I went to put vial back in medicine box. I have been sick about it all day. How simply careless of me. I know that I was extremely tired this morning. I did not get a good nights sleep, as I was having a hard time falling asleep, last night. What is so embarrasing is that I only had the one patient, and I was so careless. I pride myself on being so cautious with doing my checks. I remember focusing on the date, to see if it was still good. And, was careless with checking the right insulin. I am just grateful that I realized it before it was too late. We hurry and pumped him with some orange juice, and banana. Called the dr. and took him to ER. I have been really down on myself all day for being so careless and making a major med error! !